Opinionsite Reviews - Legit or Scam? Opinionsite Reviews – Legit or Scam? 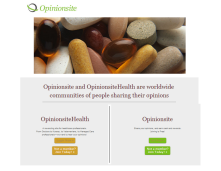 Opinionsite, found online at Opinionsite.com, is a market research site which describes themselves as “worldwide communities of people sharing their opinions” in exchange for rewards. This website says that they allow their members to share their opinion in exchange for “cash and rewards.” Whenever you complete a survey with their website, you will be awarded points which you eventually will be able to exchange for cash. You can sign up to participate in this service for free, and once you complete your registration forms, and confirm your membership by email, you will receive 1,400 points – the equivalent of $1.00 – added to your account. After becoming a member, you will then be asked to complete a short profiling survey in exchange for another 2,800 points, or $2, added to your account. Before you begin taking member surveys, you will have $3 in your account, and you only need to accumulate the equivalent of $10 before you can cash out and request a check. When working with a market research or survey site, one of the things you should always look at is the level you need to reach before you can receive compensation. A $10 minimum is a reasonable level, although they are not clear on how many points you will receive per survey after you have completed the membership process. Opinionsite also has a version of their website created especially for healthcare professionals, Opinionsite health, including doctors, nurses, veterinarians, managed care professionals, and more. These surveys will deal specifically with needs related to healthcare careers. When you become a member of Opinionsite, you also agree to receive email newsletters, account updates, and special offers which are targeted to your interests based on the information you provide to them. This is not uncommon to some market research websites. The question of whether the website is legit must be dealt with on an individual basis, between whether you can reach the described payment amount and receive reliable payments and the volume of marketing contacts you receive. If you are receiving unlimited amounts of contact from advertisers but can hardly complete enough surveys to reach your payout, the website is not considered a legitimate form of market research. If you tire of the surveys or of the various marketing communications you will receive after becoming a member, you can Unsubscribe from their services at any time, however your information will still be maintained in their database unless you contact them directly and ask that they remove all your personal information from their system. Average Rating for " Opinionsite " is 2.49 out of 5 based on 39 reviews. Same for me. Completed 50 minute survey for $500. Never got paid and got the run around from the administrator, Pat Stuart. Will not use them again. My experience seems to be common- survey completed, no payment and unable to raise any response . I’ve unsubscribed now . If not a scam prior, they appear to be now. I completed a physician survey and asked for payment. Later received an email that their computer was accidentally rejecting claims and that I should again place my request. I have tried. Web site has an internal server ERROR. Do NOT waste your time on Opinionsite. As a physician, I had done several surveys for OpinionSite. Most of the time I was credited with the points, after qualifying for the surveys. a few mos. ago I was not credited & after some back & forth with Pat Stuart, the coordinator, after about 2 mos. the lousy $35 was finally credited. More recently, a survey was completed that was supposed to pay $80. I was not credited. I contacted Pat Stuart 5X! No response! For me OpinionSite is hx. Caution is highly advised. I don't know if OpinionSit is in the process of imploding or what, but I don't want to be continuing to waste my time answering qualifying questions & participating in surveys that are not paying as claimed. I rate this at 1. Total scam!!! Completed 15 minute survey, asked many very detailed questions about my practice and travel related diseases and vaccinations and in the end said that I didn't qualify for the survey after getting exactly what they needed. Stay away and don't waste your time!!! Lots of requests sent to my inbox requesting survey participation. I have never "qualified" to complete a survey, and this "qualification" decision is made after multiple questions asked about disease incidence and treatment choices. Pat, if you want to make this "service" less of a scam, list the qualifications for study participation in the initial email so that practitioners who do not qualify do not have to waste their time. Also, consider compensating all of the people above who claim they have never been compensated. Did one hour phone survey. Was supposed to receive 115.00 have yet to receive. Emailed twice finally got response and say they will check into it. Now I see I will never receive it. Wish I would of did research on them first. multiple attempts made to complete their surveys. only able to get through part of each one before being told I did not qualify. but in the meantime, several of those surveys already had valuable survey results from my attempts. in effect -- the company receives the survey results needed for reporting, while you get paid nothing for that work. Completed several surveys and requested PayPal credit and never received it.. Will not answer any of my emails. Also received an email from them requesting my SSN.... not happening!